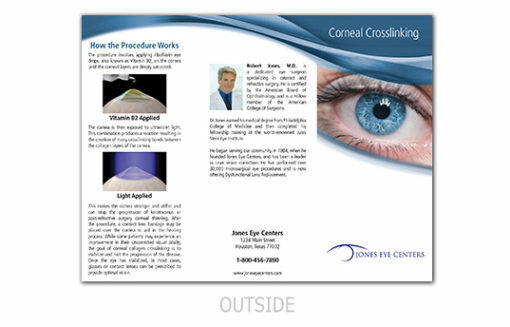 In this brochure, patients learn how Keratoconus is caused and the treatment options available including corneal transplant and the newly FDA-approved Corneal Crosslinking procedure. It also features content about Infectious Keratitis and how Corneal Crosslinking is used to treat it, finishing with an overview of the Corneal Crosslinking procedure using riboflavin eye drops and ultraviolet light. This brochure measures 8 ½” x 11”, is tri-folded, and printed on glossy 100 lb. text weight paper stock. The front and back panels are available for customization.